PLOT SUMMARY: Every ten years, a wizard known as the Dragon takes a girl from a small village, who is to work for him for a decade. In exchange, he protects the village from the evil entity known as the Wood. This time, Agnieszka is sure it'll be her best friend Kasia that is picked. Kasia is beautiful, brave, talented, and charming -- just like all the previous girls. But when the Dragon comes, it isn't Kasia he wants. FIRST THOUGHTS: This is a book I decided to read, and got very excited about, because every person I knew that read it seemed to love it. So, I gave it a go, and... eh. It's okay. I try to avoid DNFing books whenever possible, but this was a struggle to get through -- not because it's horrible or anything. It's not. It's just also not great. I'm honestly kind of baffled about what the big deal was. My main complaint about this book was that it was, honestly, pretty boring for the most part. Which is a shame, because the summary on the back cover sounded awesome. THOUGHTS ON PLOT: I saw another reviewer say that this book read like an entire saga crammed into one volume, and that sums up my issues perfectly. There were at least three plots going on here, and as a result, they all felt rushed. This is a dense book, and it does not work in its favor. While the individual plots on their own were fine, and would've made good stories, mashed up together, it felt confusing and made it a slog to get through, at least for me. THOUGHTS ON CHARACTERS: Okay, for this section, I'm mainly going to hone in on the two leads: Agnieszka and the Dragon. On their own, they're both decent characters. I thought Agnieszka was a bit dull and a little too idealized in some places, but she was far from the worst main character I've ever read, so okay. I also thought the Dragon was a good character; mean, snarky, technically on the side of good, noble, but kind of a douchebag. That's not a bad character by any means! The problem, in my opinion, was the romance between these two characters. The Dragon acts like an infuriating tool for most of the book, and Agnieszka is understandably frustrated with his pissy attitude... until the point she starts making out with him. Look, I got from the back cover that these two were gonna end up together, and I enjoy a good hate-to-love story. But the Dragon changed after Agnieszka began to fall for him -- meaning, I have no idea why she fell for him in the first place. Why does she want to be with this guy who's treated her (and everyone else) like crap this entire time? It makes no sense. Honestly, if Agnieszka had wound up with Kasia, it would've been a much better story. THOUGHTS ON WRITING STYLE: Really slow-paced. If you've been following this blog for a long time, you know I prefer fast-paced reads to slow ones, 9 times out of 10. In spite of having too much story crammed into one book, this book also managed to take forever in getting to the point. Also, while the prose was nice and the descriptions were very vivid... there's only so many times I want to read a description of a forest. THOUGHTS ON POLITICAL STUFF: I've already mentioned the, uh, "romance" that, for lack of a better phrase, reads like Twilight, so I'll let that go. (But seriously, what does she see in him?) Since the setting is in a medieval fantasy world, there is, naturally, a bit of misogyny to be had. (Some of it coming from the Dragon. Shock. Surprise. To his credit, he gets better.) There are also no POC characters or queer characters in the book. (Ugh.) One thing I will say in the book's favor, however, is that in spite of the fact that Agnieszka is one of those "completely average" YA protagonists (you know the sort; she's plain, and clumsy, and totally not unique at all until the plot goes out of its way to prove that yes, she is the Special), there's a nice lack of Not Like Other Girls syndrome. It would've been really easy for her beautiful, feminine best friend Kasia to be a villain, so I was really glad the book didn't go that route. FINAL THOUGHTS: ...I don't get it. I hear there's a movie in the works, so I may check that out, but probably not, especially if I'm the one paying for it. I really don't understand all the hype around this book. Needless to say, this was a huge letdown. Thank you so much for reading this column. If you liked it and would like to support my work, click on either of the buttons below to donate -- Buy Me a Coffee is a small, one-time donation, but becoming a Patron has several benefits and rewards. Either way, it's a huge help to me. A special thanks to those of you that choose to contribute! 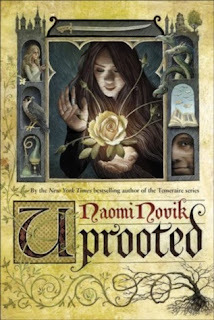 If you've read Uprooted, I'd love to hear your thoughts on it! Tell me what your opinion of the book is in the comments down below.